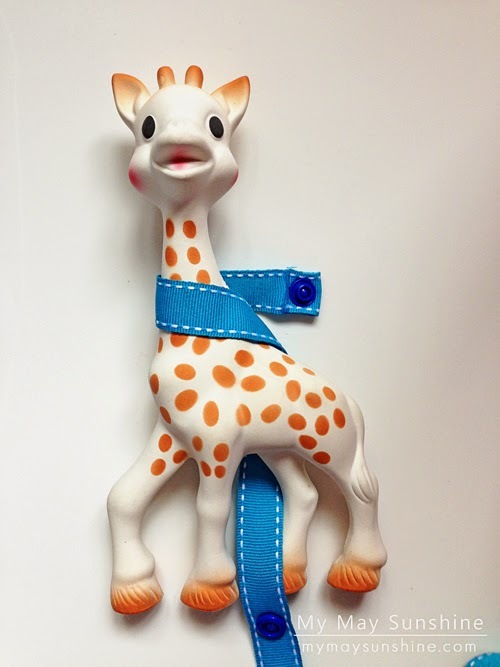 While researching the KAM pliers on Ebay, I came across straps for Sophie the Giraffe teether toy. 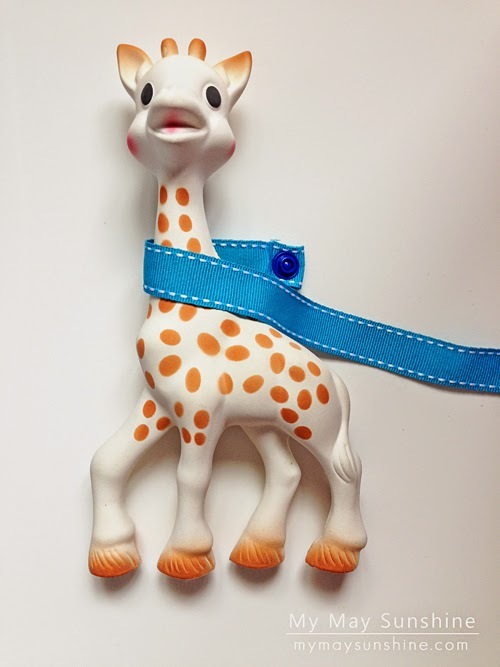 I thought this would be great to try to make with the the pliers as I had bought as Sophie the giraffe recently and it isn’t cheap and so a strap to keep it secure would be a good idea. I also came across a tutorial on how to make them on Leanne’s blog. She gives you all the measurements and where to put the snap poppers. 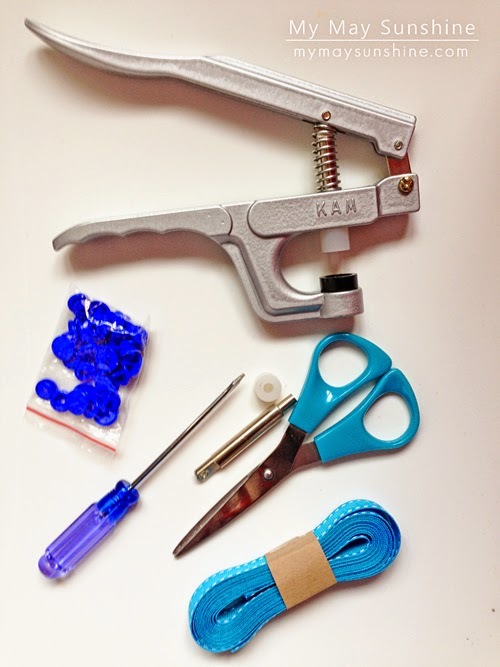 – The KAM pliers and parts. 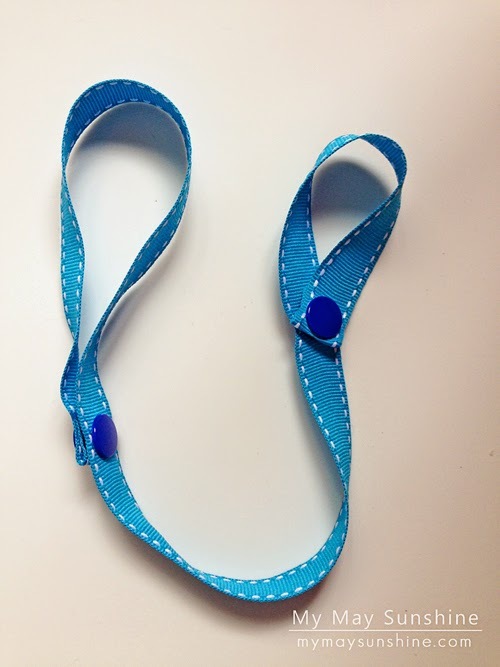 You will need some ribbon that measures 56 cm/ 22 inches in length and turn the ends over 1 cm and add a snap popper. I did make mine slightly longer so that it would hang longer. As long as you keep the outside measurements the same it will work if you would like it longer or shorter. You then need to measure 22 cm/ 8 1/2 inches and add another popper. This is the larger end which you attach to Sophie the Giraffe. From the other end you need to measure 14 cm/ 5 1/2 inches and add another popper. This end is where you tie it to the stroller. Make sure you keep all the poppers facing the same way too. Also you can add a bit of glue like I mentioned in this post to the ends before turning over to stop them fraying. This what the strap will look like when it is made. It will have a large loop on one end and a smaller loop on the other. 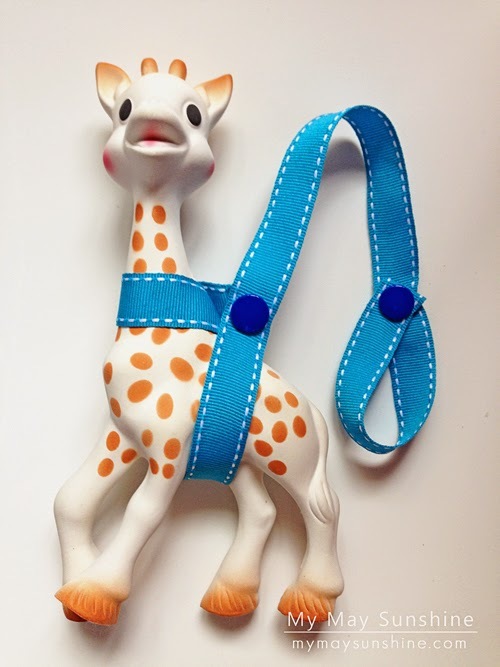 When it comes to attaching the giraffe to the strap, it is quite simple. 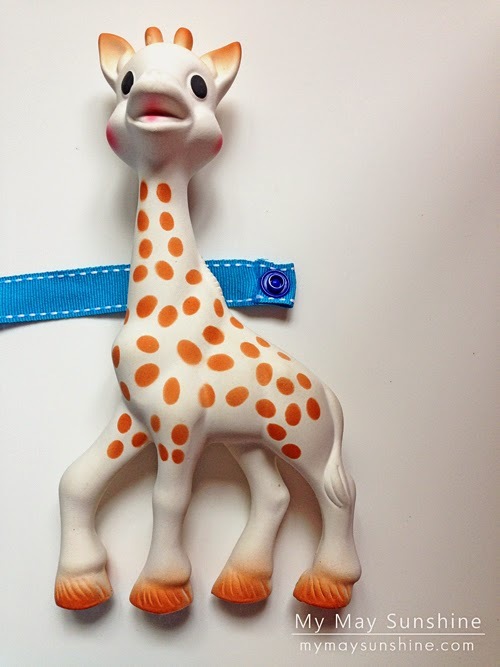 You place the strap under the giraffes neck. Then fold the strap over the neck. Wrap the strap behind and under the legs. and up over to attach the snap poppers together. You just simply attach the other end to the stroller and it’s secure. I think the straps could be very handy. What do you think? I’m having great fun with the KAM pliers and still have a few more things to make with them. Linking up to: The Shabby Nest, Chic on a Shoestring, Live Love Rowe, The 36th Avenue, Artsy Farsty Mama,Glued to my Crafts, Diana Rambles, A Bowlful of Lemons.